The following information is for those submitting resumes, for employment with Mountainview Safety Services Ltd.
As part of our pre-hire policy, we ask that you are willing to take, and pass, a drug and alcohol test. Mountainview Safety Services Ltd does provide industry training courses that are offered at a reduced cost to new hires, who may not have all of the above courses. These are paid for prior to taking the training. Resumes must include a copy of a driver’s license, a driver’s abstract and three references. Please contact our office for further clarification. To have taken all orientation for Mountainview and if available, orientation from the firms that we provide services to. All orientation sessions are to be signed off when completed. To ensure that his/her PPE is complete for the job assignment. 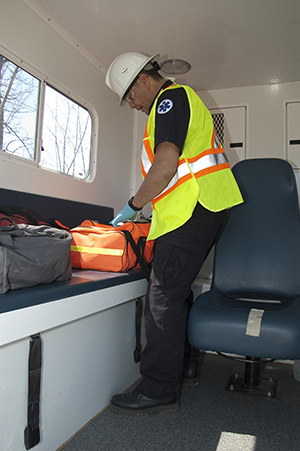 Generally, administer pre-hospital emergency care, administer medications and provide treatment to injured persons in an industrial setting. Provide an injured worker with a level of care within the scope of the attendants training. Objectively record observed or reported signs and symptoms of injuries and exposures to contaminants. Refer for medical treatment workers with injures considered by the first aid attendant as being serious or beyond the scope or beyond the scope of the attendant’s training. A first aid attendant must be physically and mentally capable of safely and effectively performing the required duties. At a place of medical treatment. By an acceptable ambulance service. By a person with a higher or equivalent first aid certification. The first aid attendant does not have the authority to overrule a worker’s decision to seek medical treatment or the worker’s choice of medical treatment. 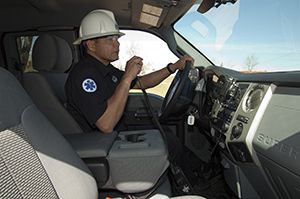 Provide medical transportation to medical facilities, maintain ambulances, MTCs, or transport vehicles, the internal and external areas of the truck itself, the emergency equipment and related emergency supplies. Must have a Class 4 or 5 drivers license. Site responsibilities as directed by the consultant. 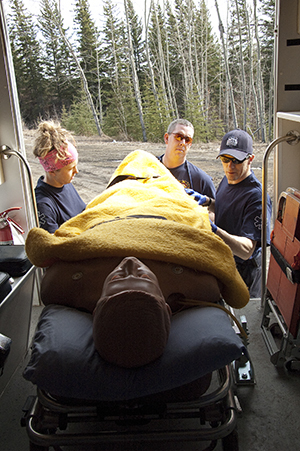 Our job assignments will take you to various locations in the Peace Liard region. To ensure that each truck and MTC is kept in a clean and acceptable state, ready for random checks. To be aware that each of you is a representative of Mountainview Safety Services while in the field and to conduct yourself accordingly when talking with other staff members and industry personnel. We take safety seriously and have an in-depth manual (available upon request for prospective clients) that covers Pre-Job Safety Checklists, Safety Policies, Incident and Accident Forms, Action Plans for Emergency Responses, Emergency Response Procedures, Professional Dress Codes, Guiding Principles and more! We provide for all your First Aid, Paramedic and Training/Testing needs!